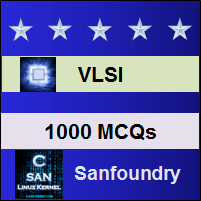 This set of VLSI Multiple Choice Questions & Answers (MCQs) focuses on “BiCMOS Inverters”. Explanation: In BiCMOS, bipolar transistors are used to drive output loads. Bipolar transistor can also be used as amplifier, switch or as an oscillator. Explanation: In BiCMOS circuits, MOS switches are used to perform logic functions. The ability to turn the power MOS “ON” and “OFF” allows the device to be used as a very efficient switch with switching speeds much faster than standard bipolar junction transistors. Explanation: The nMOS and pMOS transistors used in BiCMOS device operates in enhancement mode. Enhancement mode devices are mostly common switching elements in MOS. Explanation: The inverter has low input impedance. The basic inverter circuit requires a transistor with source connected to ground and a load resistor connected from the drain to positie supply Vdd. Explanation: The inverter has low output impedance and low input impedance. These are some of the properties of a BiCMOS inverter. Explanation: The inverter has high current driving capability, occupies smaller area and has high noise margins. 7. Output voltage swing should be reduced for a better performance of BiCMOS circuit. Explanation: For a better performance BiCMOS circuit, the output voltage swing should be reduced. The possible maximum output peak-to-peak voltage obtained without clipping is called as output voltage swing. 8. BiCMOS inverter requires high load current sourcing. Explanation: BiCMOS inverter needs high load current sinking and sourcing. Sinking provides a grounded connection to the load, whereas sourcing provides a voltage source to the load. Explanation: BiCMOS has higher standby leakage current and thus has high power consumption. Explanation: For improved base current discharge, two enhancement type nMOS transistors have to be added. Explanation: In BiCMOS circuit, the BJT transistors are in Totem pole configuration. Explanation: MOSFETs provide zero static power dissipation and high input impedance.